When you walk into a supermarket in Honolulu and are surprised to see Americans you know you’ve been living in Asia too long. I was so glad to be on vacation and in a state known for its paradisiacal qualities, it took all my strength not to run up and hug those other Americans in theFoodland. Well, until Joe reminded me we were in, uh America. To tell you the truth when Joe and I merged on the H1 in Oahu, from the car rental lot I looked at him and said, “this is Hawaii?” in a very sarcastic and bitter tone. We had just spent over 15 hours in transit to get from the unparadise of Songtan, South Korea to the tropical utopia of Hawaii. I was not in the most chipper of moods to say the least. 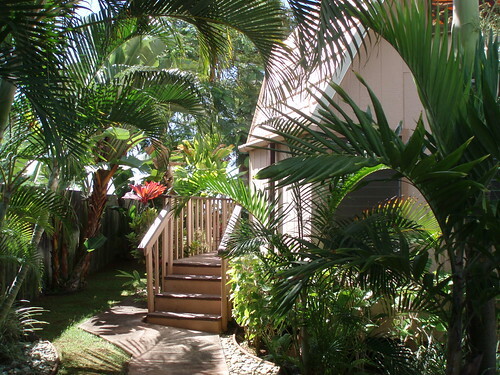 As we followed the directions to our rented vacation house on the beach through what can only be described as South Central Oahu, taking in the beautiful scenery of crack house architecture we found our cute little house. Just a few short hours later I was all woozy on the smell of palm trees and was totally and unabashedly in love with this island, although Joe would attest that the wooziness was from my pina colada. But anyway… There’s really nothing like a view of the powerful and soothing ocean when you’re used to the view of a parking lot from a high-rise apt. complex. This was the beautiful view from the kitchen of our rental house – it wasn’t hard to get out of bed at the wee hour of 10 AM to this stunning panorama. 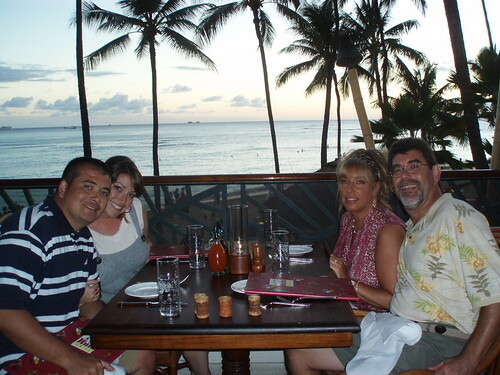 Joe and I met my parents in Oahu for the week and it was so nice to see them. Our week was spent lolling about on the beach, with occasional strenuous trips to a golf course or shopping mall, followed by a back-breaking 2 hour meal at a wonderful restaurant. Oh, life can be so tough at times. One of the highlights of the trip for me was the 4 hours I spent at Ross Dress for Less and Old Navy with my mom. Korea’s idea of a bargain store is an overpriced outlet of clothing with fake designer names like Reeboc or Anne Tyler Loft. An hour at Wal-Mart also managed to satisfy my big box-store needs for the next 4 months. A day at the Ala Moana Mall in Waikiki was also a very fruitful trip in the shopping dept. Let’s just say I probably memorized the display arrangements at Sephora. While Mom and I were spending all our hard-earned cash my Dad and Joe were hacking up the greens at the beautiful golf courses in Hawaii. We would drop them off, head to the day’s shopping destination and then pick them up, tired and sandy from 18 holes. With sunburnt necks and slightly tipsy from a few beers they would bore regale us with stories of their best drives of the day. 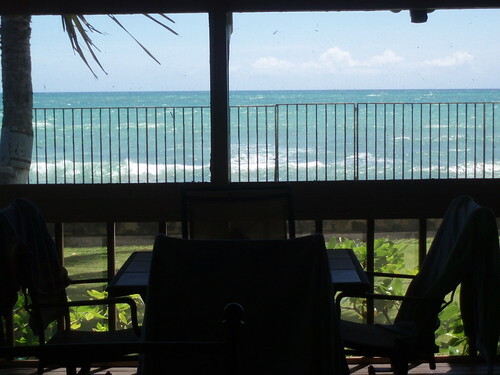 Back at the house, we’d sip wine or frozen drinks while showering and getting ready for dinner and then head out to any number of fantastic eateries in Honolulu. Our favorite was the Hula Grill at the Outrigger Waikiki Hotel. The food was delicious, the drinks were strong and the waiter was very handsome knowledgeable. By the end of the week we were exhausted and refreshed at the same time, not ready to return to work or the “real world” and defintely not ready to leave our tropical oasis. The only saving grace was making plans for my parents’ trip to Marbella, Spain next June. Because as my mom once said, “life is the time spent in between vacations.” I shed a few tears on the plane ride home. Tears for missing my parents and friends in the US and tears for having to return to Korea. One thing is for sure, if Joe and I have anything to say about, Hawaii is definitely on our wishlist as a future base location. When we get stationed there you can all come visit, I know a place where they make the best pineapple Hawaiian shave ice! P.S. I didn’t want to put a million photos on this post but if you want to see more Hawaii photos click here. delurking to say that i’m glad you enjoyed hawaii. i’m catching up on blogs due to a hectic week so i was disappointed to read you had come and left because if i had known i would have kept my eyes open at ala moana or something just in case you walked right by me. my husband and i are army and we’re stationed here for now and we LOVE it. i grew up in honolulu so it was a double bonus for me to come back here. the cool thing is we might be stationed in korea next (which is what led me to your blog), and i think it would be quite an adventure. i’m glad you enjoyed your stay here! Oh, what a wonderful vacation it was, especially since Dad and I reconnected with you and Joe. We looked at the pictures you posted on flickr and they are wonderful — so representative of our good times together. May we have oodles more vacations just like that one.